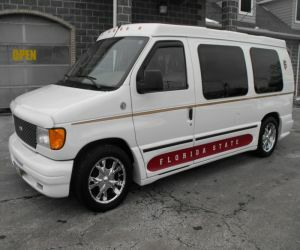 This 2005 Ford Florida Seminoles is selling for $27,500. There are 13,937 miles on this van's odometer. The engine and the transmission are in great working condition. There does not appear to be anything wrong with them at all. All around this vehicle appears to be worth the selling price and definitely worth buying. There are four sun roofs on this van that pop upwards, for better climate control and for better fresh air. There is even a remote to get into this vehicle so you do not have to fumble with your keys at night. This vehicle inside is in great condition. The seating is tan and red in color. The material for this is leather. They are in great condition, showing no cracking, holes or damage. The carpet is the same way it does not have any wear and tear to it.There is so much to keep you entertained in this big boy such as satellite radio, there is a radio towards the back that has am/fm. There is also a vhs and dvd player. There are speakers all around this vehicle. So you are not bothering other this also has 2 head sets to block the noise. The seating and cup holders are heated! Besides that the seating also has power operated positioning so you can sit in comfort. The driver seat is a 6 way power seat. The driver and passenger seats both have air bags for your safety. Everything on this van is power operated such as windows, doors, steering , mirrors and more. All of the sating folds down flat so you have more room if you are hauling larger items. The outside of this vehicle is white in color with red writing on it. There does not appear to be any kind of damage done to it either. Such as rusting, dents and scratches. All of the chrome is almost in perfect condition, there are a few little dents near the wheels and right by the trailer hitch. The windows and windshield are all in good shape, they do not have any spidering or big cracks. However there is a small chip in the windshield at the top right area. The roof has a very tiny leak in it. There was some wetness on the left back seat, nothing major though. The tires are Cooper Discovers H/T. The under-carriage of this van is also in good condition, there is some dust and very minor rust spots but other than that nothing is bad under there.